George C. Cannon, a Harvard sudent, built at least two steam race cars in 1901 - 1902. His burners came from Peter Forg in Sommerville, MA. 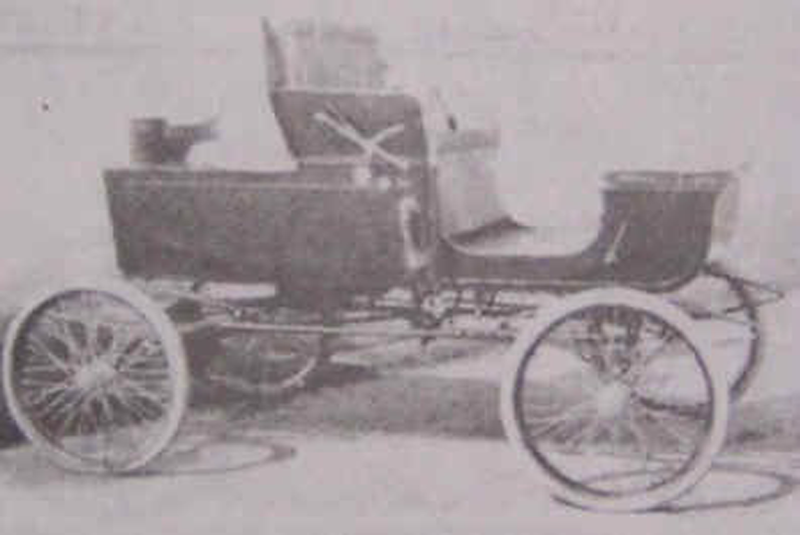 Charles E. Miller of New York built the chassis. Currier, Cameron, & Company of Amesbury, MA constructed the body. CC&Co later built high end bodies for the Stanley Motor Carriage Company. Cannon entered the August 23, 1902 Brighton Beach race at Brooklyn and his car ran a mile in one minute, seven and three fifths seconds, an amazing speed at that time. Cannon graduated from Harvard, and in 1905 went to work for the Grout Brothers in Orange, MA as a test car and racing car driver. Cannon may have built a touring car. 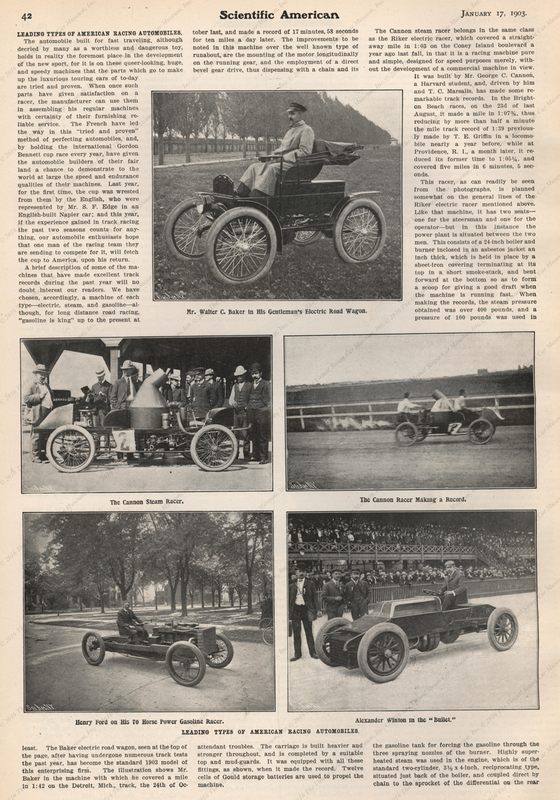 "Leading Types of American Racing Automobiles," Scientific American Supplement, January 17, Vol. lxxxviii, No. 3, pp. 42 - 43. Georgano, G. N., Encyclopedia of American Automobiles, (New York, E. P. Dutton & Co., 1968), p. 124. 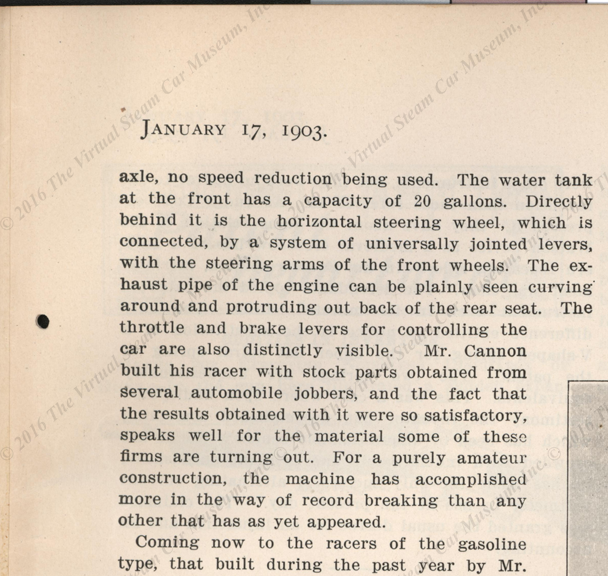 Most of this information comes from the Early American Automobiles Website. It is similar to the Kimes & Clark information. The web master was unaable to find links to communicate with the creator of this site. Kimes, Beverly Rae and Clark, Henry Austin, Jr., "Cannon Steam Racer," Standard Catalogue of American Cars: 1805 - 1942, 3rd Edition, (Krause Pubications, Iola, WI, 1996) p. 252. Contact us if you have additional information about the George C. Cannon Steam Racer, or if you have questions.